Since the Constitution of the United States was written, it has included stipulations for a democratic government and for a free press. Charlotte Grimes, a former professor at the Newhouse School at Syracuse University, believes these two things are not mutually exclusive. “You can’t have a democracy without a free press,” says Grimes, who spent 11 years as Newhouse’s first Knight Chair in Political Reporting. In 1999, the Newhouse School received a $1.5 million endowment to create the Knight Chair position. David Rubin, dean of the Newhouse School at the time, applied to the Knight Foundation to establish the chair. Grimes, who spent two decades as a reporter for the St. Louis Post Dispatch, became the first Knight Chair in Political Reporting in 2003. She retired at the end of the spring 2014 semester. During her time as Knight Chair, Grimes created Democracywise, a website that features her students’ political stories and is a voter resource. She also heads up the Robin Toner Program in Political Reporting, which recognizes high-quality political journalism. The program is named for late Newhouse alumna Robin Toner ’76, who was the first female national political correspondent for The New York Times. 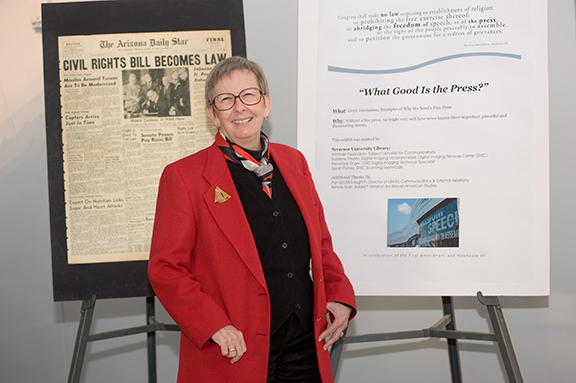 As Knight Chair, Grimes also hosted the Civil Rights and the Press symposium in 2004, which brought together leading journalists who covered the civil rights movement. Robert McClure, professor emeritus at the Maxwell School of Citizenship and Public Affairs, served on the search committee for Grimes and taught the Press and American Democracy class with her. “If you wanted to hire a reporter, you wanted to hire Charlotte,” McClure says. Liam Migdail-Smith ’10 says his experience covering the New Hampshire presidential primaries for Grimes’ political reporting class was influential in his decision to become a newspaper reporter. “Pretty much everything you do is going to have some sort of political angle to it,” he says. Melanie Hicken ’09 helped Grimes run Democracywise. She now works as a reporter for CNNMoney.com. “At Syracuse, I saw firsthand how important political reporting is,” Hicken says. “‘Speaking truth to power’ is something Professor Grimes says a lot. Providing transparency and helping people make informed decisions—those are things that she talked about probably in every class. Note: Grimes retired at the end of the 2013-14 academic year. The Newhouse School is conducting a search for her successor.